Notes: Ablaze! 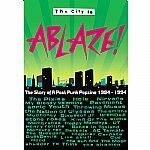 fanzine was published in Manchester and Leeds in the late eighties and early nineties by Karren Ablaze! The best bits of this notorious and outspokenly passionately zine are now available in book format. Alongside hundreds of zine pages, The City Is Ablaze! features new writings by Karren and other members of the Ablaze! team, as well as interviews with fanzine writers John Robb (Rox), Dave Haslam (Debris) and Richard Johnson (Grim Humour), essays by DIY cultural commentators Lucy Cage and Deborah Withers, a re-examination of the Riot Grrrl movement by those who were part of it, and an epilogue by Gary Jarman. This 320-page A4 book also covers other zines that Karren produced in Manchester and Leeds between 1984 and 1994, capturing an era where DIY was de rigueur and indie actually meant something. You'll be able to read original interviews with the following bands (in chronological order). The book also includes irate letters from Morrissey and Thurston Moore. The City Is Ablaze! reads like a musical history of the late eighties and early nineties, a history that could only be obtained by surfing the sliproads, sneaking backstage at a thousand shows, sleeping on strangers' floors and living to type up the tales of the sounds that defined an era.